There's a reason why Brookfield infra Partners, Welltower Inc, and AES Corp are among the most reliable high-yield dividend stocks today. To protect ones self, the yield-seeking investors needs to look for stocks that not only offer high yields but also have strong dividend growth potential that can support those yields. That's what makes high-yield Brookfield infrastructure Partners (NYSE:BIP), Welltower Inc (NYSE:WELL), and AES Corp (NYSE:AES) such great dividend stocks. 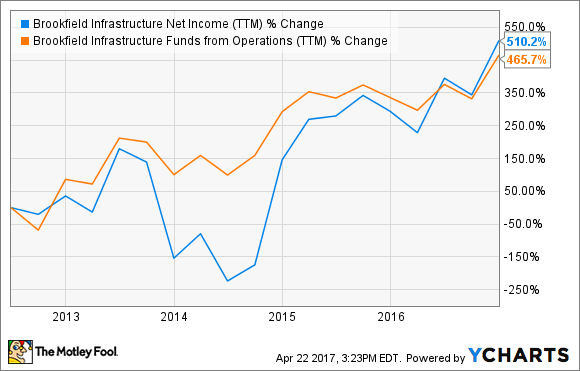 As a company that owns and operates infrastructure assets across the utility, energy, transportation, and communications sectors, Brookfield Infrastructure Partners fits the definition of a classic recession-proof stock. Brookfield's strength lies in an asset base that's widely diversified across defensive sectors. That eliminates volatility in sales and profits to a large extent, which has been rewarding for shareholders: Brookfield has grown its distribution (dividend) per unit at a compounded average clip of 12% since going public in 2009. With the master limited partnership growing its net income by 66%, FFO by 16%, and dividend by 11% in FY 2016, and now focusing on growth in high-potential markets like India and Brazil, income investors can trust this dividend yield for years to come. Welltower is a fantastic dividend stock to own for two major reasons: It's a real estate investment trust or REIT -- which offers a dividend security -- and is focused on healthcare, which is a defensive industry. As icing on the cake, welltower is the largest healthcare REIT in the marketplace. Leveraged to nearly every aspect of healthcare, including senior housing, post-acute care, and outpatient medical solutions. You probably can't find a better, and safer, name to gain exposure to healthcare whilst collecting steady dividend payments. Safe, because Welltower acquires interest in established healthcare properties in growing regions in the U.S., Canada, and the U.K. and leases them out to reputable healthcare providers to jointly operate and develop the properties. It is its high-quality, diversified asset base that has allowed Welltower to more than double its FFO (Funds From Operations) in just five years. The company hasn't missed a dividend since inception in 1971, and has grown its dividends at a compounded annual clip of 5.6% since that year. Welltower's dividends might not grow rapidly, but it can be counted on when the going gets tough. With only a fraction of healthcare properties currently owned by REITs, and private pay now making up more than 90% of Welltower's revenues, there's tremendous growth potential for the company in terms of partnerships. As the company grows, so should its FFO and dividends. Unlike most utilities, AES doesn't have a great dividend history, having just started an annual dividend in 2013. But it has almost doubled its dividend since because AES isn't your typical power company. Through its seven utility subsidiaries, AES provides energy to customers in 17 countries across four continents. But AES' strength goes beyond its vast global presence: It is also derived from its focus on renewable energy. The company generated 27% of its power from renewable energy sources like wind, solar, and hydro last year. Earlier this year, AES announced plans to acquire majority stake in sPower, the largest privately owned solar assets operator in the U.S., following which its total renewable energy projects portfolio will grow nearly 15% to 9,552 MW. At the same time, AES unveiled what it claims to be the "world's largest lithium-ion battery-based energy storage facility" with a capacity of 37.5 MW, built in partnership with San Diego Gas & Electric. If those numbers reflect AES' focus on renewables, its operational performance has been equally impressive, with the company targeting 8%-10% average annual growth in adjusted EPS, free cash flow, and dividend through 2020. Knowing management is committed to high growth in dividends is, perhaps, the best income investors can ask for.